When Helen is taken in, she leaves part of herself outside. Her outside self attempts to unpick the events that led to her arrest. She remembers going to the tree to meet Jabu. There was a riot, but she doesn’t remember causing it. 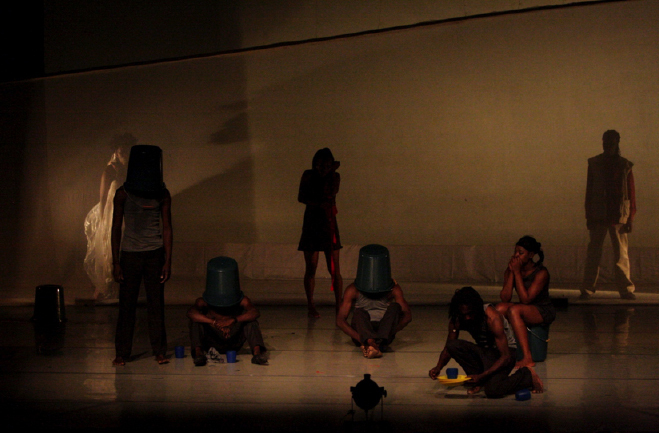 This dance-theatre production explores culpability and truth when the law is arbitrarily applied. Indeterminate waiting and uncertainty play out as a metaphoric expression of Zimbabwe’s situation, power play between guards and prisoners within the walls not only depict how violence with impunity is justified, but also provide comic relief. Finally, the audience is invited to question how justice can negotiated. The production is structured in order to achieve focussed debate and engagement, and intensive contact with the issues is facilitated through an interactive workshop process.